We can’t be more excited with the introduction of Visconti’s new Disegno! A new collection from the Pininfarina line-up. So many folks have been wanting to get a Pininfarina but were just not willing to pay the (close to) $2000.00 price. The Disegno has many of the design features of the Pininfarina just not the complicated application. The Disegno fountain pen features Visconti’s famous magnetic cap closure system where powerful magnets hold the cap firmly closed when not in use. The main body and cap for the pen are made from jet black resin. The stainless steel nib is in the same profile as the original as well. Nib option are Extra Fine, Fine, Medium, Broad and Stub. The pens ship with a standard converter and can utilize standard ink cartridges from Monteverde and other brands. 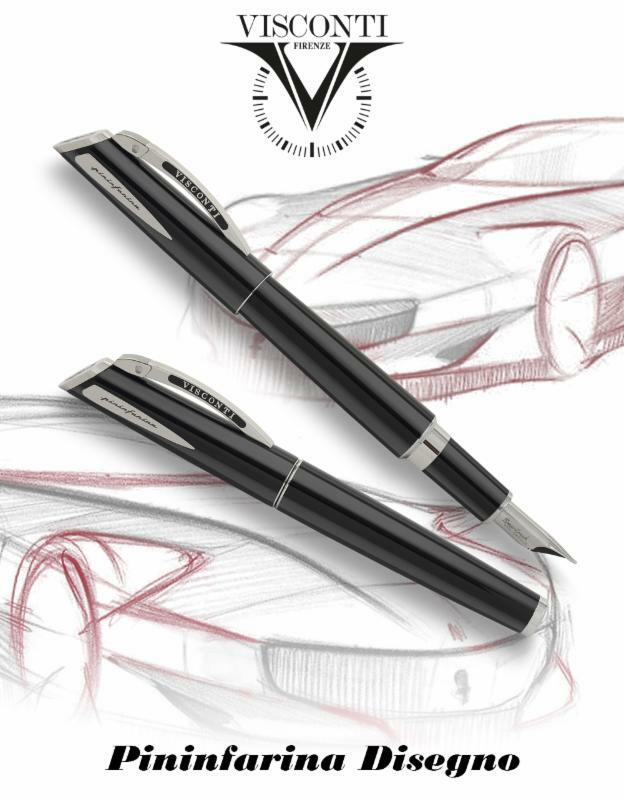 The newest release from Visconti is inspired by the very successful limited edition releases Visconti and Pininfarina developed together. Maintaining the same innovative and modern design seen in the previous styles, the Visconti “maison” re-engineered the pen and developed the Pininfarina Disegno, now a part of Visconti’s regular collection. The new design combines the stylistic excellence the Pininfarina Collection is known for with a resin body, stainless steel trims and a cap with a magnetic closure. The dimensions are for everyday use as the pen perfectly fits the standard dimension of a shirt pocket. It’s a daily pen, versatile and lightweight with a simple filling system to facilitate the daily use. Bertram’s Inkwell is proud to present the new Pininfarina Disegno line comprising three writing instruments: fountain pen, rollerball and a ballpoint pen. Made of precious resin in Classic black, the collection maintains the sophisticated clip mechanism, the tubular smartouch nib and the magnetic locking system invented by Visconti in 2008. I couldn’t agree more with what Bert says! This is a surprisingly substantial pen! Whether you want the awesome tubular nib (which my first thought is that it would go great with their mosquito filler) used on the fountain pen, or the versatility of choosing a gel or ballpoint refill in the ballpoint pen, there’s no denying that this pen has a great look and feel! It has a great weight to it, so you know you’ve got a real nice pen in your hand! At the same time, it’s not too heavy so as to tire your hand when writing. And I love the options of using your favorite inks in the fountain pen! If you haven’t tried their stub nib, I highly recommend it (I love mine)! !